Dipel DF contains the bacterial Bacillus Thuringiensis v. kurstaki(Btk). It is a dry, flow-able formulation which is dust-free. It is registered to control most caterpillar insects on fruits, citrus, tropical fruits, vegetables, grains, bulbs, flowers, herbs, turf, ornamental trees and shrubs. After ingesting a lethal dose, larvae stop feeding within the hour and will die within several hours to 3 days. It is best used when the larvae are actively feeding but before the plants are damaged. Actively controls; loopers, hornworms, armyworms, leaf-rollers, cabbageworms, cutworms, webworms, gypsy moths, tent caterpillars, alfalfa caterpillars, and other lepidopterous insects. • Contains 54% Btk. 46% inert ingredients. • Listed by OMRI for use in organic production. • Provides adequate control of worms in nuts, cotton, soybeans, corn and other crops. • May be used up to the day of harvest. Agricultural: Use .25-2 lb/acre; general rate is 1lb/acre. 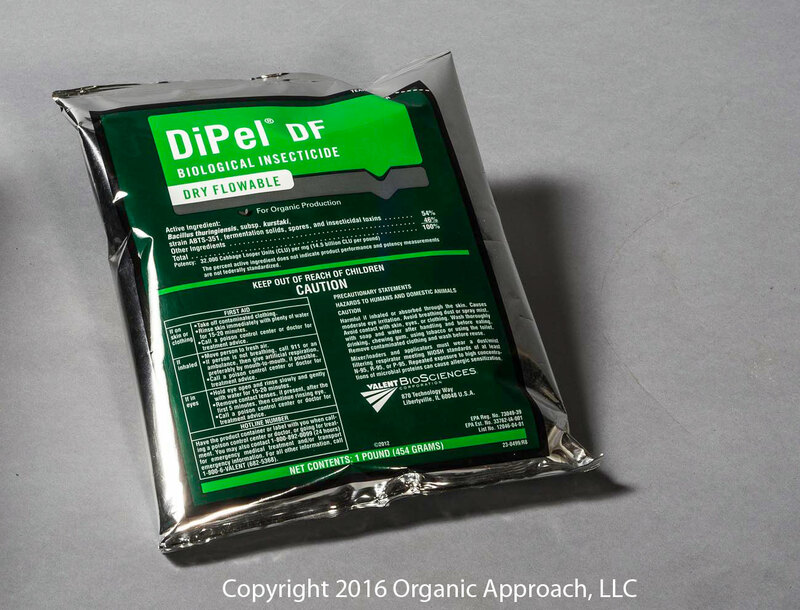 Dipel, available in an emulsifiable suspension (ES) as well as a dry flowable (DF) formulation, is registered on more than 200 different crops, including vegetable and fruit crops, row crops and even specialty crops and berries. Its highly selective active ingredient makes the product fatal to more than 55 species of worm (lepidopteron) pests without harming humans, beneficial insects, birds, fish or wildlife. Plus, Dipel has a four-hour Restricted Entry Interval (REI), the lowest allowed by law.